I was hopping around on Flickr the other day when I happened upon a photo stream from the United Kingdom’s Consumed by Cake. When I saw her simple cake that she had covered in fondant and adorned with a ribbon and brooch, I thought the idea was positively delightful. It would be a way to incorporate your “something old” in a less traditional way. 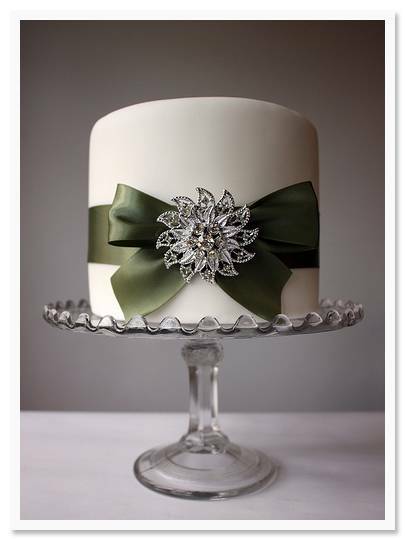 With the clean, contemporary lines of the cake and ribbon combined with the antique aesthetic from the brooch, it would be a perfect cake design for someone looking for a cake with “vintage modern” appeal.